Satbras, part of Brazil’s largest provider of satellite television equipment, is testing its set-top boxes using XJTAG boundary scan in preference to in-circuit testing. Advantages include efficient test development, ease of use and high test coverage, as well as international technical support for Satbras’ engineering activities in Brazil and China. Satbras sought an alternative to ICT, to introduce successive new products more quickly and to reduce the cost of test, while at the same time increasing test coverage. Ease of use was another key requirement, for fast and efficient product development, production, and field maintenance. Carlos Ottoboni and his team identified boundary scan as a solution to the cost and time overheads, and the diminishing testability, experienced with ICT. Boundary scan equipment is easily connected to the unit under test using a standard board-edge connector. Tests can exercise JTAG-compatible components that are directly attached to the boundary-scan chain, as well as non-JTAG components such as memories connected to the same nets as JTAG components. Boundary scan tests can be used to verify designs, debug prototypes, test production units, and repair units in the field. “The high quality of technical support provided was another key reason for choosing XJTAG”, he adds. “We needed a partner capable of supporting the system at our sites in Brazil and China, to ensure the best possible results throughout the product lifecycle.” XJTAG provided native-language support for both teams through its local offices, and also supported Satbras through its UK headquarters. XJTAG has brought numerous benefits to design, assembly and field-maintenance activities. It is able to perform many PCB tests in a few seconds, and is easier to use and more effective than ICT for modern designs. The high quality of technical support available was another key reason for choosing XJTAG, including support for the system at our sites in Brazil and in China as well as valuable help to review new designs to optimise test coverage. Using XJTAG has shown how boundary scan rewards best design practice, leading to higher testability and end-of-line yield. 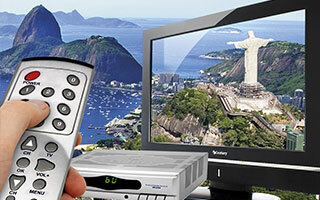 Satbras is a business unit of Century Group, Brazil’s largest provider of satellite television equipment. Based in Manaus in the state of Amazonas, and having an international network of engineering offices, Satbras produces digital and analogue set-top boxes for terrestrial and satellite services.